You are cordially invited to join us for a one-day training on perinatal mental health presented by Maternal Mental Health NOW! 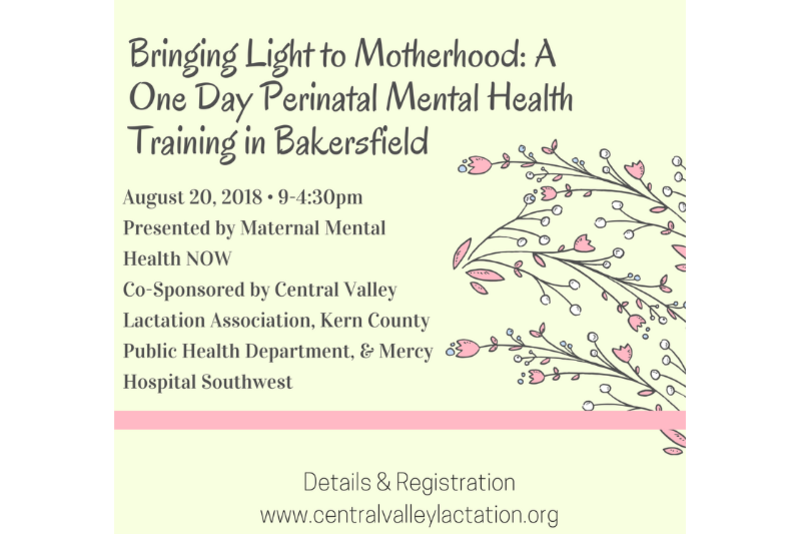 Bringing Light to Motherhood is a full-day workshop to be held in Bakersfield, CA. The perinatal period, spanning the time between conception and the first year following childbirth, encompasses a range of mood disorders that can affect a woman during pregnancy and around the time of birth. Left untreated, maternal depression leads to long-term depression in the mother, a lack of emotional availability for the baby, and detrimental outcomes in the development of the fetus, newborn, and developing child. This training will review evidence-based screening tools, prevention, and treatment. Your registration fee of just $100 covers our costs in bringing these phenomenal speakers to Bakersfield! Any profits above those costs will be used for the operational needs of Baby Café Bakersfield. Participants must attend all sessions in order to obtain continuing education credit. Nursing children in arms are welcome to attend. Private accommodations will be provided for lactating parents. All events co-sponsored by Central Valley Lactation Association are compliant with the International Code of Marketing of Breastmilk Substitutes. This education will be presented by Maternal Mental Health NOW, whose mission is to remove barriers to the prevention, screening, and treatment of prenatal and postpartum depression in Los Angeles County. Visit www.maternalmentalhealthnow.org for more information. Gabrielle Kaufman is a dance/movement therapist and licensed professional clinical counselor with over 20 years experience in the helping profession. Currently, she is director of Training and Technical Assistance for the Los Angeles County Perinatal Mental Health Task Force. Prior to this, she served as director of the New Moms Connect Program of Jewish Family Service of Los Angeles providing services to new parents, particularly those suffering from symptoms of postpartum depression. Ms. Kaufman has worked extensively with new families and aided in providing solutions to many parenting concerns. She has run several programs for high-risk children and teens, taught classes to parents of newborns and toddlers, and runs support groups for single parents and women with postpartum depression. Ms. Kaufman has spoken widely, published articles on parenting, and served as editor for Bringing Light to Motherhood. She serves as Los Angeles coordinator for Postpartum Support International also has a private practice in Los Angeles providing services in both English and Spanish languages. When registering for this event you give your consent to be interviewed, videotaped, and/or photographed for use by CVLA. By completing the registration process for this event, you agree to this photography policy and consent that you will use the associated handouts ONLY for your own education and not share them or any photos or screenshots anywhere, including on social media. Refunds are available until Aug 13, 2018 at 11:30p.m. Pacific time, less a $30 processing fee. IBCLCs are the clinical experts in lactation care and are able to provide the highest level of breastfeeding support for all breastfeeding problems, including complex situations. In Bakersfield, IBCLC services can be difficult to access, and Baby Café Bakersfield provides these services because they are necessary to ensure that all families in the community have the opportunity to reach their own breastfeeding goals.